It is hard to believe that as I write this my time in India has come to an end. Delhi has come to feel like home, and it seems surreal that I will be leaving in less than two weeks. My nine months here have been rich in learning and experiences I will always treasure, and my academic work has progressed and evolved in ways that would have scarcely been possible without the sustained immersion made possible by my stay here. 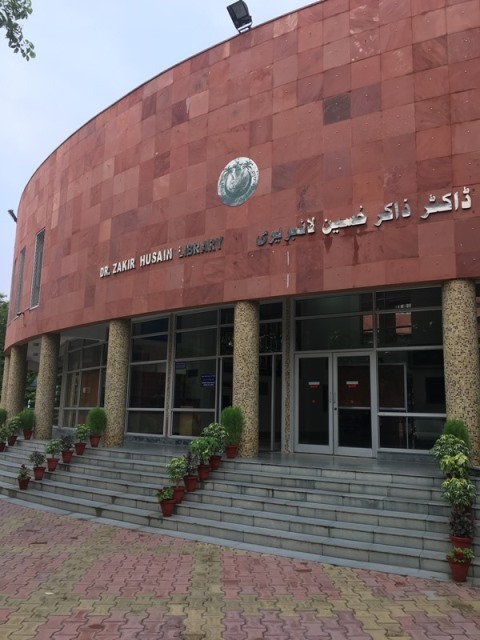 My formal archival research in the manuscript collections of Jamia Hamdard and Jamia Millia Islamia was just the beginning, though it did provide me with a wealth of primary source material that will keep me busy translating and analyzing for a long time. Since my dissertation research is concerned with the garden culture of seventeenth- and eighteenth-century North India, actually spending most of the year here, rather than just the brief and disconnected research stints for which I am usually able to come, was tremendously helpful. For the first time, I got to properly live through and experience the seasons and observe many of the horticultural operations discussed by the texts I study as they were unfolding throughout the city’s many wonderful parks, nurseries, and in private gardens. Thus whenever I was not busy at a manuscript library, reading, or writing up my findings, I would explore the city and in particular its green spaces, visiting new places and returning to old favorites. There are the obvious ones, of course, like the Tomb of Humayun or Lodhi Garden, but I also grew particularly fond of some lesser known sites. The Tomb of Najaf Khan in Jor Bagh’s B.K. Dutt Colony, for instance, is a late eighteenth-century elite Mughal tomb surrounded by a large, immaculately maintained garden. 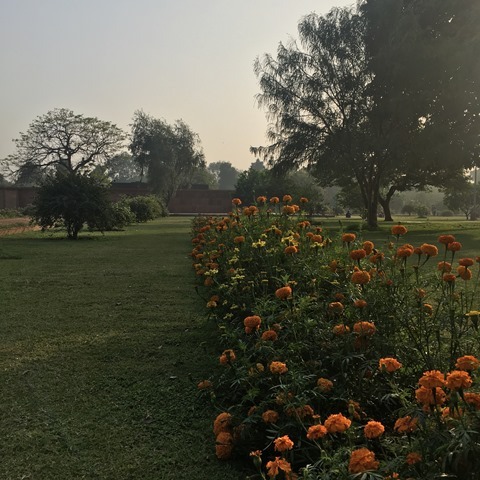 While the plantings are not original, they come closer to what my research suggests would have been common in the aristocratic gardens of late Mughal Delhi than what one sees at most other similar sites. Much of the garden is planted as an orchard with amla trees and innumerable varieties of citrus but there are also always plenty of flowers along the paths and many beautiful tree specimens, most of native species. Coming back to this garden throughout the year was both highly instructive and always a joy for the senses, especially since it is always peaceful. Only a few people from the neighborhood seem to come to exercise or pass the time with friends or family – in fact, the place is so calm that I often see people studying there. 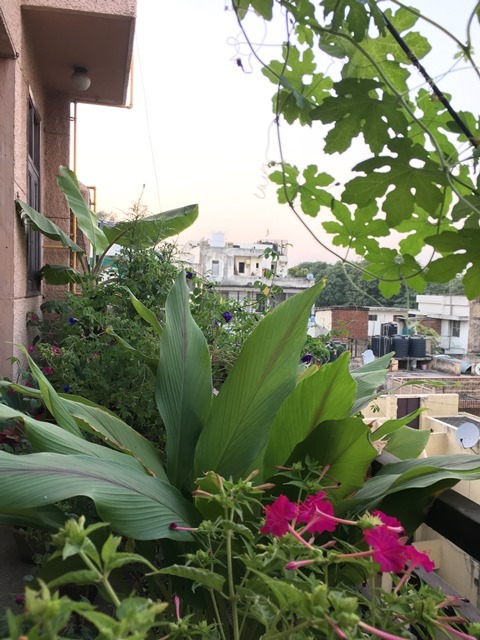 The balcony of my apartment also gave me an opportunity to partake in some gardening myself, and over the course of the summer I assembled a bit of a jungle of turmeric and banana plants, bitter gourds, roses, and many annual flowers. As I write this I have chrysanthemums, marigolds, and jasmine blooming – luckily between a local friend who is an avid gardener – and as result often a helpful informant for my research – and my landlady I know that all my plants will be well taken care of after I leave. My research and my explorations of Delhi’s gardens also led to another unexpected yet wonderful opportunity when I was able to contribute to the third Delhi Walk Festival as a volunteer guide. 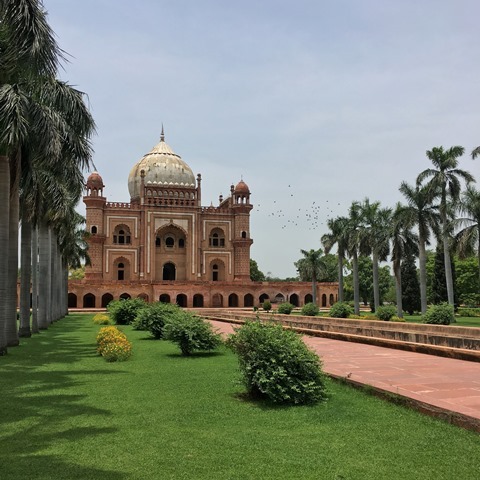 I designed and led a walking tour that encompassed both heritage and nature and drew on my literary research to highlight a number of eighteenth-century Mughal garden sites – including the tombs of Najaf Khan and Safdarjung – and what they can tell us about Delhi’s gardens and environment and the way they have changed over the last three hundred years. The walks were a great deal of fun, and the enthusiastic questions and input from the participants have even been helpful in refining some lines of inquiry for my dissertation. There have of course been other highlights during my time here as a Fulbright Researcher – showing friends and family around Delhi and Agra during visits, a trip to Udaipur with a friend that was both absolutely wonderful and very helpful to my research – but the best part of my stay by far has been to experience and be a part of everyday life here in Delhi, to live with its rhythms and seasons. From the mangoes of summer to the lights of Diwali and winter’s gajar halva, that has been the greatest joy that I had not been expecting, and something I will miss dearly upon returning home.